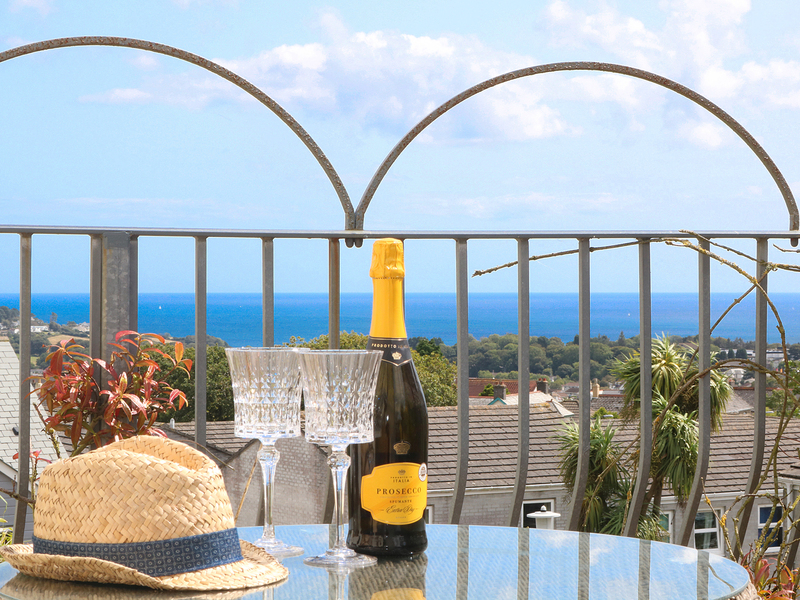 Ocean View is a luxurious apartment with enticing sea views located in St Austell and within a 5 minute drive of the fabulous Cornish Riviera coastline. The sandy beach and coastal golf course at Porthpean and the historic port of Charlestown, renowned for its tall ships and for the filming of the BBC's Poldark series, are a 5 minute drive. The world famous Eden Project with its rain forest biomes is a 10 minute drive and the charming fishing village of Mevagissey, Pentewen Beach and famous Lost Gardens of Heligan are a 15 minute drive. A little farther afield is the maritime town of Fowey with independent shops and harbour front restaurants and pubs. It has a romantic bedroom, swish bathroom with a Jacuzzi bath and the sitting room has a large picture window with far-reaching views across roof tops to the broad sweep of sea at St Austell Bay. The smart and well equipped kitchen has a dining table with chairs for romantic dinners. There is a private balcony with sea views accessed via the front door. Designed for couples and the style-conscious, the spacious proportions and elegant interiors are a triumph. Gas central heating. Electric oven and hob, microwave, fridge (no icebox), washing machine, dishwasher, TV with Sky, DVD, WiFi ( Signal can be Intermittent )and selection of books. Fuel and power inc. in rent. Bed linen and towels inc. in rent. PARKING - Off road parking for one medium car, also has road side parking if necessary. Balcony with furniture. Sorry, no pets and no smoking. Shop 1 min walk, pub 10 minute walk. Note: Children are not accepted at this property. Note: Tesco Express across the road. Note: All bookings for December 2018 - January 2019 will receive a welcome package from the owner on arrival.